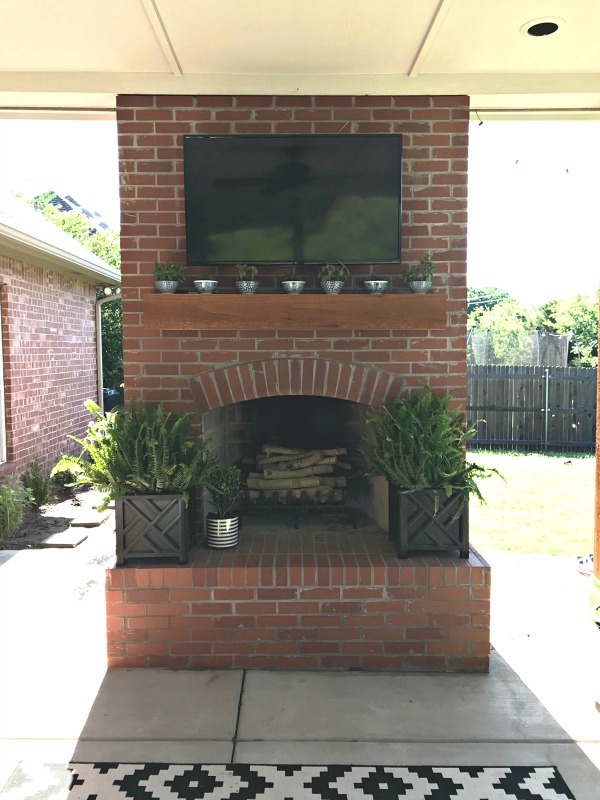 When we remodeled our patio three years ago, a brick outdoor fireplace was one addition we knew we wanted to incorporate. 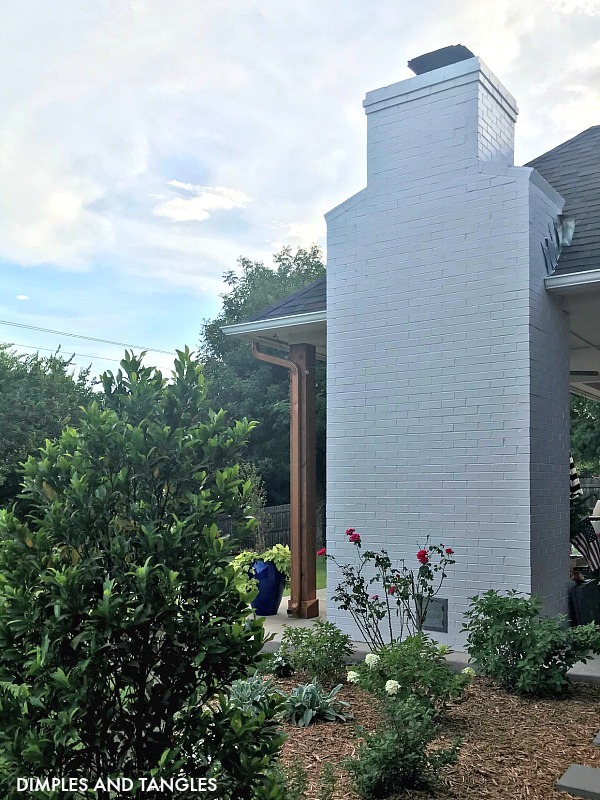 Unfortunately, the brick used on our over 20 year old home exterior was no longer being made, so I chose new brick that was as close of a match to the original as I could get. The color was similar, but the new didn't have the patina that our original brick has and the slight difference in material always just bothered me a bit. Early this year I finally made up my mind to just paint it, and now I only wish I had done it sooner! 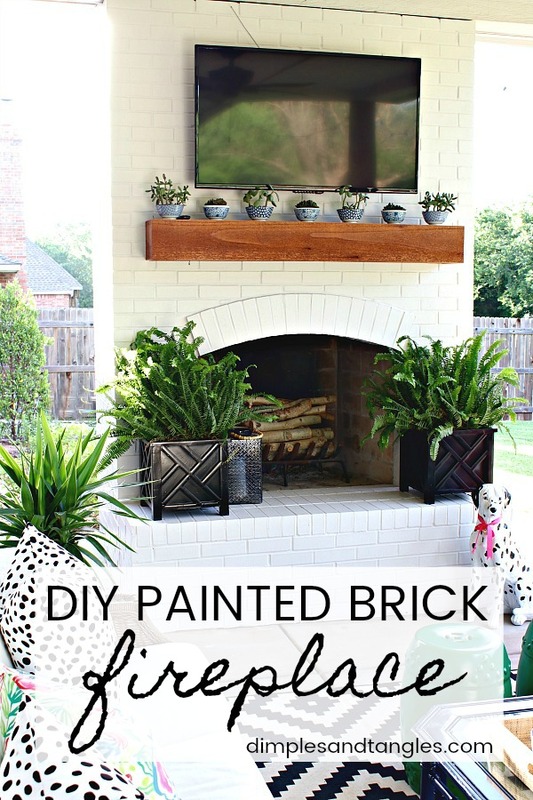 Here's a quick recap of how we painted our exterior brick fireplace. It's such a straightforward project, and I would use this same process for interior or exterior brick. *This post may contain affiliate links, which means I might make a small commission at no extra cost to you. Read my full disclosure policy here. 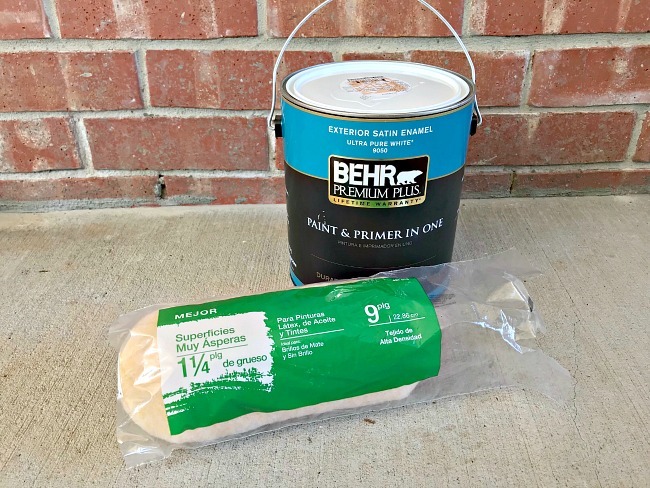 SUPPLIES: exterior primer, exterior paint, a brush (I love this one) and roller. 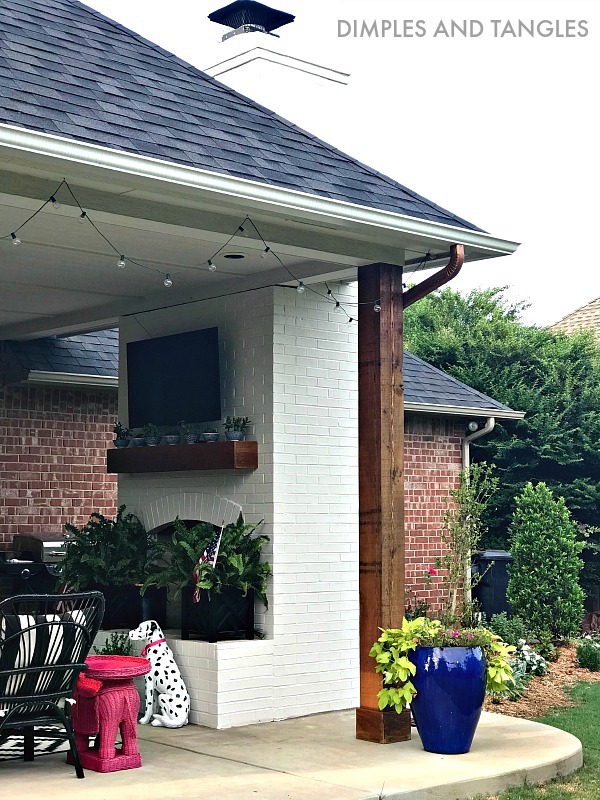 The paint color is Sherwin Williams Simple White (matched with Behr paint) which is what we used on the rest of the patio too. Here's a little disclaimer- I used several different rollers in the process and one was definitely the best. 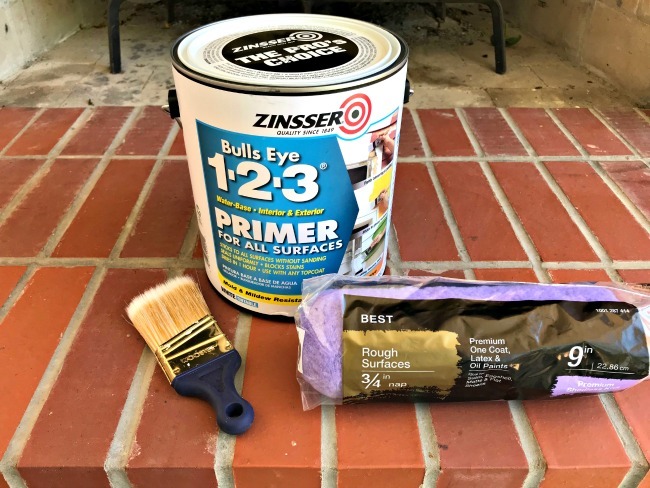 I used the purple 3/4" roller on the first coat and I should have used a thicker roller. Even though our grout lines aren't very deep, it did not get down in them hardly at all. I found this lambswool roller cover in the garage and used it afterwards and totally should have used it from the beginning. It grabs so much paint and really gets down in the grout lines, can't recommend it enough for a brick surface. 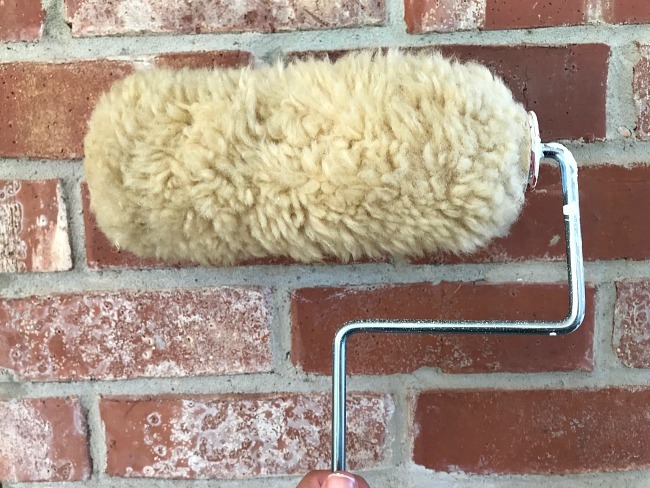 The 1 1/4" roller was fine for some of the top coats once we had a good coat of primer on, but really at least get a good base on with a super fluffy roller like this one. I cleared everything off but didn't worry about the tv mounting bracket, I just cut in around it. Give everything a good sweep/vacuum/wash- whatever is needed to make sure it's as clean as possible. 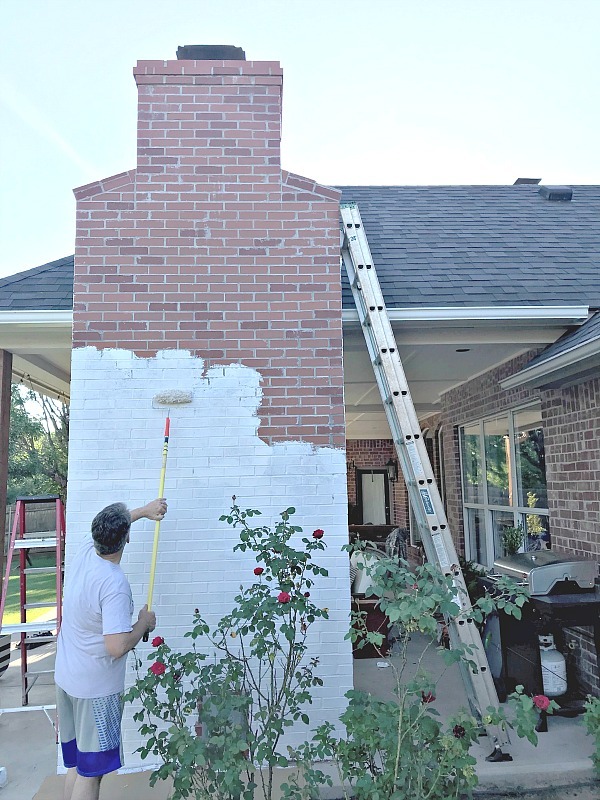 If you do wash the brick make sure it's dry before you start painting. I started by rolling on a coat of primer (here's where I should have been using the lambswool cover!). After a coat of primer. Afterwards I went back with a brush and made sure that I covered all of the grout lines. Here's where my photos get a bit thin... I was focused on trying to make a video and forgot to take some still shots at this point in the process. But, see the video below! One coat of primer was sufficient, then we repeated the process with two coats of the exterior paint. 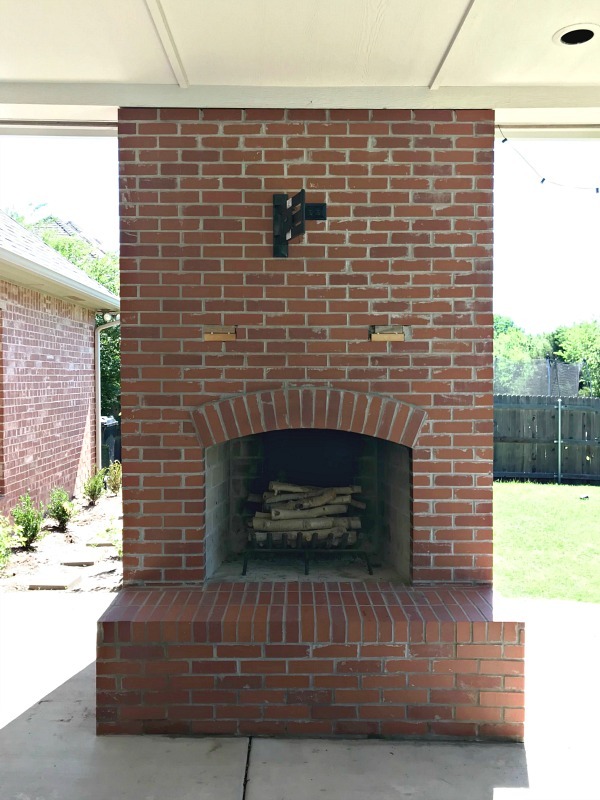 One thing to note, our brick had a very smooth finish. 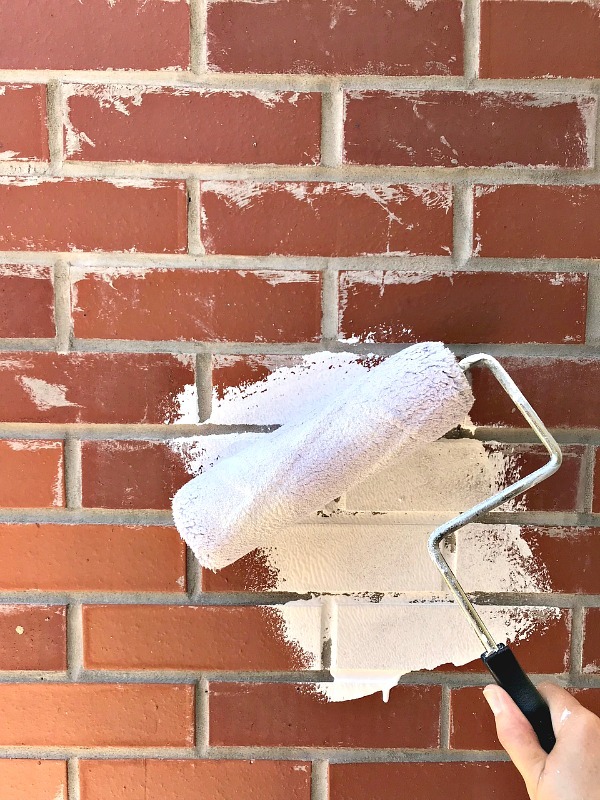 If yours is very textured or porous you might need another coat of primer and/or additional coats of paint. The back and top of chimney were definitely the most challenging parts due to the height and working around the roof. If you paint occasionally and don't have an extension pole for your roller it's a life saver (great for painting ceilings too)! Ray did the entire back except the very tippy top while still on the ground. So far the paint is holding up perfectly. We water the ferns often and water leaks onto the hearth. Yesterday I washed it all down where the leaking had left dirty spots and it cleaned up beautifully. I really can't get over how much the change lightened up the whole space! Love seeing that pretty white out the window now. Here's a quick time lapse video of the process with those extra steps I forgot to photograph! 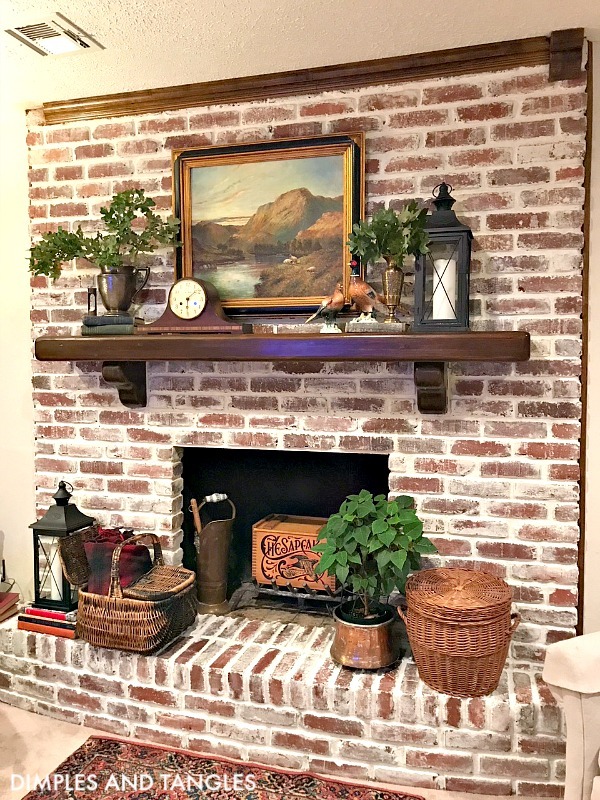 If you have brick in need of an update but are not sure you want to commit to fully painted brick, check out this related tutorial of how my sister and I did a mortar wash on our parent's brick fireplace. I'd love for you to join my email list! You'll receive a notification straight to your inbox any time there's a new post on Dimples and Tangles. Simply enter your address below. This looks beautiful!! and you make it look so easy......... you are definitely an inspiration to me for this and so many other projects you've shared.......thank you! thank you! thank you!! Oh, thank you Julie! Your feedback means so much, glad you've found some good ideas here! 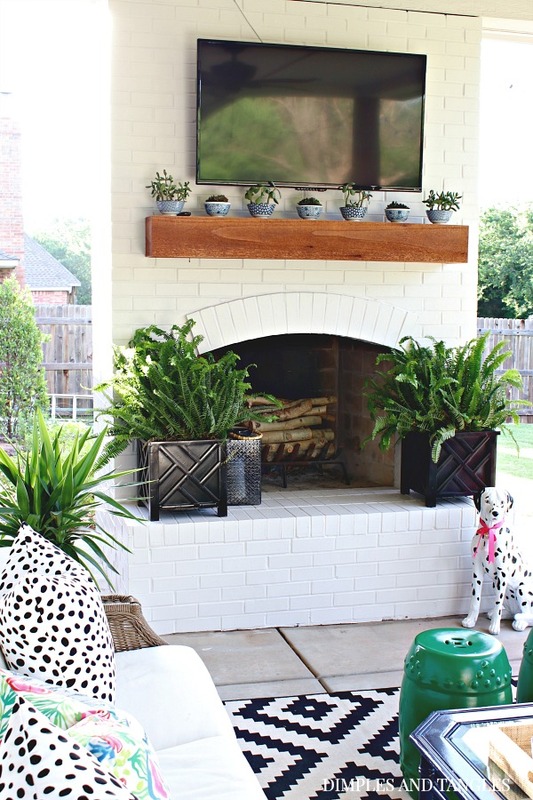 Love the fireplace painted white. It looks amazing. Thanks Marty, it freshened the whole space up for sure! Thank you, so glad I made the change! 100% better! Looks great and y’all did a great job. 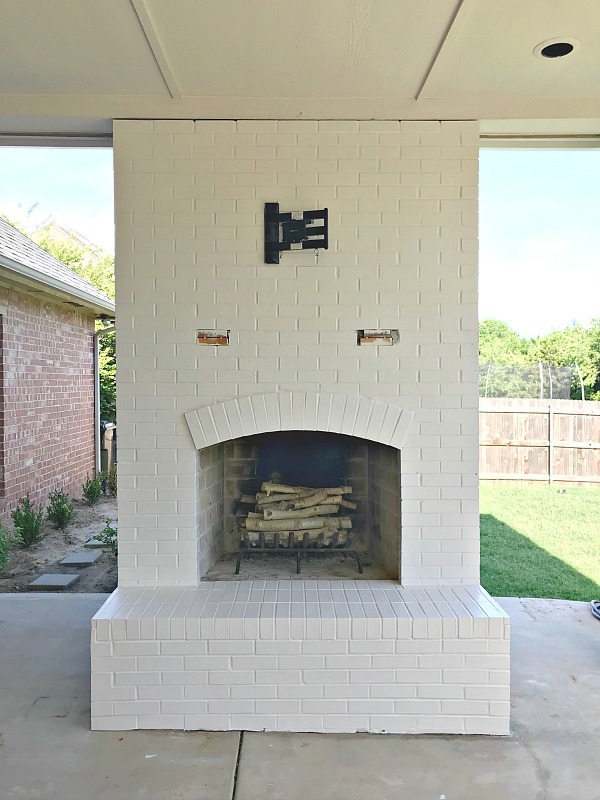 I love brick painted white. Always looks so clean and fresh. 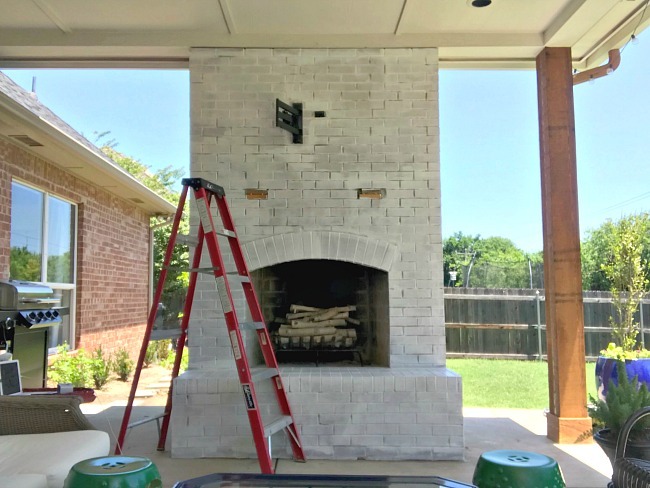 The fireplace painted white looks fabulous! I love it. You are such an inspiration. Pinned too. This is the perfect backdrop for your unique style. I love how everything pops now. 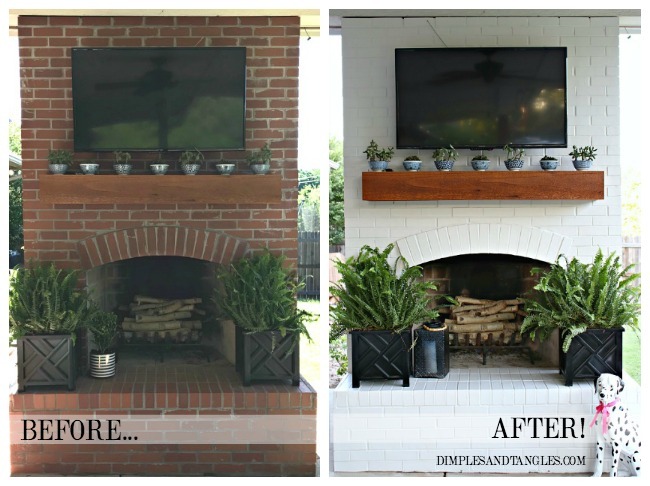 I love how the mantel pops off the white! This looks fantastic! 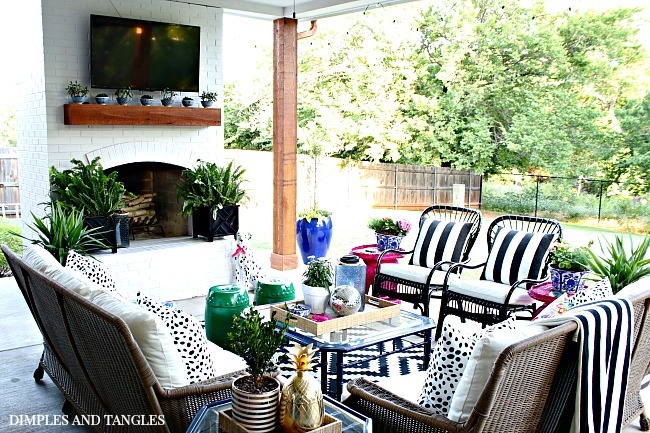 Love the change to white, as it looks so clean and is a great with all your patio pieces. 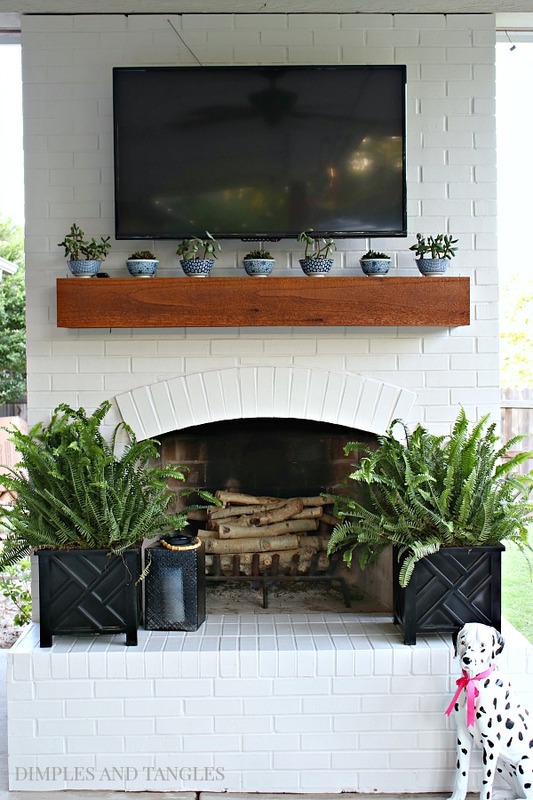 Are you considering painting the interior of the fireplace black? or do you think that might make the black items you have blend in too much? Just thinking of doing this for my interior fireplace, so wanted your opinion!! I'd love to have you link up every week at Talk of the Town! The party is every Tuesday at 18:00. I hope you'll come! Thanks so much for leaving a comment, they make my day! If you have a specific question, please make sure to check back here as I will respond in the thread, or leave your e-mail so that I can respond personally. Or, email me directly to address in "Contact" section at top. Copyright © 2016 Dimples and Tangles. Powered by Blogger. © 2015 Dimples and Tangles. COPYRIGHT ©2011-2017 BY DIMPLES AND TANGLES - BLOG DESIGN BY GEORGIA LOU STUDIOS.